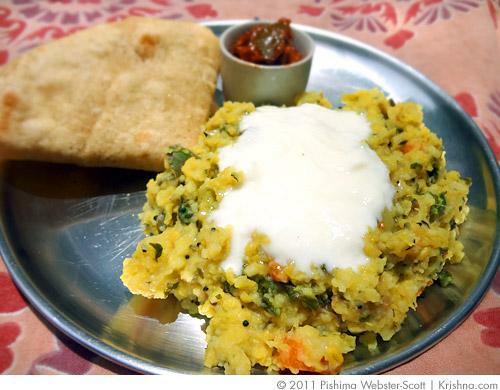 One of the beautiful things about kitchari is that you can adapt it to whatever vegetables you have at the time. I happened to have some kale, carrots and summer squash but you can put cauliflower, potatoes, spinach, peas, whatever you like really. I like to add my vegetables into the pot in order of how long they take to cook so that they are not over-cooked by the end of the cooking process. However, many people add the veggies all at the beginning and end up with delish kitchari. Lowfat Note: Although this recipe is already quite low in fat, if you use olive oil or canola oil instead of ghee, you'll be that much better off. You could also reduce the salt to 1 1/2 teaspoons, and add just a touch more ginger and asafetida to balance out the flavor. Submitted by Anonymous on Wed, 12/05/2012 - 19:13. Submitted by Anonymous on Wed, 08/29/2012 - 10:55. Submitted by Anonymous on Mon, 08/08/2011 - 09:29. After adding the rice, I cook it in one go in the pressure cooker and allow two or three whistles and the Kitchari is ready. If you have added more water for a soup consistency, then I put the pressure cooker on sim for around 10 mins after the initial three whistles. This way the veg is cooked really well and it is a quick meal! The average cooking time after adding the rice is under 15 - 20 mins.